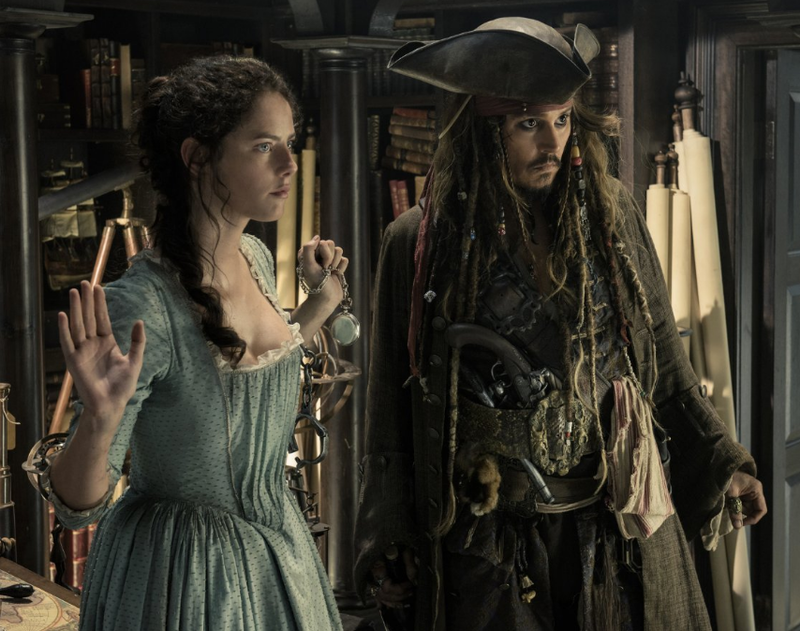 "Is that a pistol in your belt, or..."
While there's no denying that its CGI effects are stunning and its massive set pieces are impressive, Disney's latest "Pirates of the Caribbean" outing still manages to seem going-through-the-motions generic. Like Pierce Brosnan's 007 movies, it's serviceable and sometimes spectacular, but feels more obligatory than inspired. Although longtime fans' minimum-requirement brand-extension needs will be met, "Dead Men Tell No Tales" not only won't rank as anyone's favorite of the five films in the franchise, it may not be in their top four. That doesn't mean it's bad, but that it's just sort of "there." Johnny Depp is back as the more-staggering-than-swaggering Captain Jack Sparrow, who seems more incidental to the plot here than in any of the other installments. This is partly because two new next-generation characters get more screen time than they merit. One reason audiences may feel resentful over this is because Orlando Bloom's heralded return as Will Turner, who did not appear in the last installment, turns out to be little more than a pair of cameos. One of the newbies is blandly handsome Brenton Thwaites as Henry Turner, son of lovers Will Turner and Elizabeth Swann (Keira Knightley) from the first three movies. Last seen as a child at the end of "At World's End," the now-grown Henry needs Captain Jack's help to find Poseidon's magic trident, which he thinks can free his father from the curse that has kept Will bound to the Flying Dutchman for two decades. That quest is complicated by an unpleasant maritime encounter with the genuinely creepy living-dead Captain Salazar (Javier Bardem, even more frighteningly villainous here than he was in "Skyfall"), who has his own reasons for wanting to find Jack. The other addition is Kaya Scodelario ("The Maze Runner") as Carina Smyth, a spunky-smart astronomer and time-studying horologist (a term of which many amusingly sophomoric jokes are made). By a rather fortunate coincidence, she also is looking for the trident, using a cryptic guidebook left to her by her long-missing father. They hook up with Jack after he and his latest crew—which includes longtime charmingly exasperated first mate Gibbs (Kevin McNally)—pull off a quite literal bank heist that is town-wreckingly stupendous, but not quite as lucrative as they would have liked. The always excellent Geoffrey Rush reprises his role as the wryly wily Captain Hector Barbossa. His lucrative piracy empire is threatened by Captain Salazar's death ship that is manned by deteriorating and intriguingly incomplete crewmen. With all of that going for it, though, the movie is missing the spark that would elevate it from being merely satisfactory to something special. Director Gore Verbinski's first three "Pirates" movies were more enjoyably tongue-in-cheek and insanely hyperactive. Director Rob Marshall's "On Stranger Tides," with its missionary-mermaid romance and Jack's reluctant relationship with Blackbeard's daughter Angelica (Penélope Cruz, who sadly does not make a reappearance here), had more heart. Considering that "Dead Men Tell No Tales" (directed by "Kon-Tiki"'s Joachim Rønning and Espen Sandberg) wraps up enough subplots that it could be the franchise's finale, this potentially last voyage should have been more than merely adequate. Also, this is one of those rare movies with an end-credits scene that you're better off not sticking around to see. It's so unnecessary that it actually detracts from the impact of the movie's climax, and should not have been included.